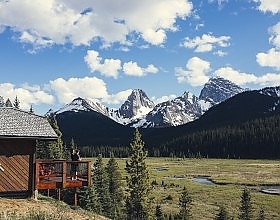 Nestled in the mountains west of Calgary, Mount Engadine Lodge is a backcountry retreat offering guests an authentic Canadian Rocky Mountain experience. 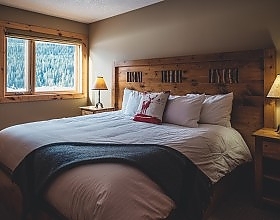 Situated one hour from Canmore, the Kananaskis Range of the Spray Valley Provincial Park, the lodge is open year-round and provides all of the charm, warmth and adventure of an intimate backcountry lodge while being easily accessible by car and offering guests luxurious amenities. Inside the main lodge, guests can relax in the common area next to the large stone fireplaces and wall-to-wall windows showcasing the spectacular surroundings. Breakfast, afternoon tea and family-style dinner are included in your overnight rate and are served in the large, bright dining area with stunning views of the mountains and wildlife. We also provide a packed lunch for your outdoor adventures. Guests have the option to stay in suites located in the main lodge, or in private cabins. For those looking for a little extra adventure – a yurt is also available upon request. To help visitors truly disconnect, there are no in-room telephones, computer jacks, or televisions. However, the lodge does offer free Wi-Fi for those needing to stay plugged-in. 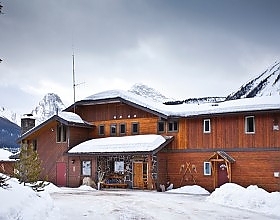 Mount Engadine welcomes the entire family and pet-friendly accommodation is available.